Los Angeles, California, is recognized almost as much for its smog problem as it is for its NBA franchise. This hazy, brown-grey fog that often lasts entire weeks during the summer is a combination of several pocketed chemical reactions and a unique geographic situation that often places cool air above warm air. The cold air presses down on the warm pockets where the chemical reactions occur and prevents the resulting gas from escaping into the upper atmosphere. This process is known as inversion. Inversion can result in an accumulation of ozone and other volatile organic compounds such as PAN. Ground level ozone has been implicated in lung tissue decay, cell damage and scar tissue formation in the lungs. This is because the O3 molecule is extremely unstable and breaks into O2 and O very easily. This rouge oxygen atom attaches to cell walls and causes oxidation damage. The oxidation process often releases free radicals (unbound electrons) that rip through nearby cells until they either leave the body or are absorbed in another chemical reaction. The higher the concentration of tropospheric ozone the more of it will be inhaled and the more damage will be done. Repeated or elongated exposure to this component of photochemical smog has been linked to asthma, eye irritation, coughing, chest congestion, chest pain, nausea and headaches. People with existing pulmonary health issues like heart disease, bronchitis, and emphysema can see life threatening situations arise due to high ozone concentrations. On an environmental level, high ozone levels can cause problems with plant reproduction and growth. If there is too much ozone, many plants will close their stomata and stop the diffusion of gases and water in the tissue. Photosynthesis stops and the plants begin a sort of hibernation period. If the levels don’t come down the plants will die. Photochemical smog is formed when ultraviolet light breaks down primary pollutants (hydrocarbons and nitrogen oxide emissions from cars, fossil fuel power plants and other organic combustion operations) into Ozone and other volatile chemicals. High levels of Nitrogen dioxide cause the air to turn brown in color. The darker the smog is the higher the concentration of NO2. This is vital to understand because the production of Peroxyacetylnitrate is directly related to the concentration of NO2 in the air. Nitrogen dioxide (NO2), oxygen (O2) and hydrocarbons are activated by ultraviolet radiation and form peroxyacetylnitrate (CH3CO-OO-NO2). This means that the more primary pollutants that are released into the atmosphere in the early morning and afternoon hours the higher the concentration of secondary pollutants may become. In areas where there is heavy traffic or a proliferation of factory type industry, the chances of photochemical smog and tropospheric ozone are markedly higher. This doesn’t mean that it doesn’t occur in the country, pockets of hydrocarbon and ozone can be carried miles from their point of origin and end up over crop fields where they can wreak havoc on the plants there. 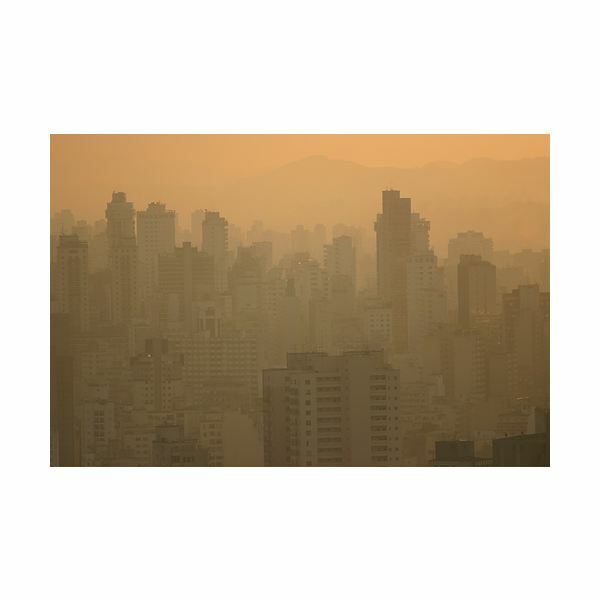 The actual chemical process that creates photochemical smog begins with primary pollution from factories and automobiles in the early morning hours. Gasoline burned by the early morning commuters releases Nitric Oxide (NO), Carbon Monoxide (CO) and several hydrocarbon compounds including ethylene, formaldehyde and acetaldehyde. In a process that takes roughly two hours NO combines with Oxygen in the atmosphere to form Nitrogen Dioxide (NO2). The NO2 absorbs photons of light that split it into two components, Nitric Oxide and a single atom of Oxygen. This single oxygen atom is the source of all the trouble. The single Oxygen atom quickly bonds with standard O2 molecules to form Ozone (O3). This Ozone will then complete the cycle by combining with Nitric Oxide to form Nitrogen Dioxide and Oxygen (O3 + NO<——>NO2 + O2). This last reaction goes both ways depending on the amount of Nitrogen Dioxide and Nitric Oxide in the air. If the ratio of NO2 is three times greater than NO then Ozone will be formed. If it is less than three to one then the Ozone will be destroyed and photochemical smog will be eliminated. Knowing the chemical process that forms ground level ozone is the first step in coming up with solutions. Fumitake Chisaka of the Mechanical Engineering Laboratory, Namiki 1-2, Gakuen, Ibaraki, in Japan in his article “Effect of Vehicle Exhausts Control for Photochemical Smog Prevention," showed the need for a system that reduces the number of hydrocarbons that enter the atmosphere as well as a second system that will handle the NO emissions. As for the other major producers of the initial pollutants that form smog, the Federal Government has been revising the Clean Air Act of 1970 on a continual basis to help remove these toxins from the air. A major overhaul in 1990 targeted these gases in particular. The best possible solution to this problem is finding a source of energy that doesn’t involve burning hydrocarbons. Solar, Hydro and wind energy are all good starts (even “clean" coal isn’t bad) but they aren’t yet at a level where they can be used as the primary means of locomotion for a practical passenger vehicle. When these technologies have advanced enough then maybe we will have total relief from the effects of photochemical smog.